Earlier this morning gossip site TMZ reported that former WWE champion Dave Batista had signed to fight with Strikeforce, but 5thRound.com was able to confirm through the promotion that the report is incorrect. Once the report hit the ‘net we immediately got in touch with Mike Afromowitz, who is the director of communications for the California-based promotion. “The report is not correct. 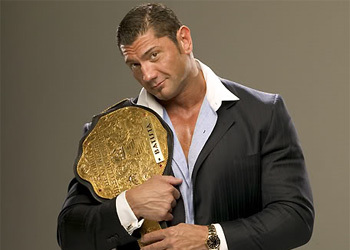 Batista is not signed,” Afromowitz told 5thRound.com. Batista has stated in the past that he would like to get his feet wet in mixed martial arts, but it’s currently unclear how serious he actually is. We do know that his contract with the WWE has expired and that he may follow in the shoes of The Rock, Dwayne Johnson, and become a Hollywood movie star. Former WWE play-by-play man Jim Ross did say that Batista has done some MMA training in recent months and that he too heard that the former pro wrestler wanted to fight, for real. Who said wrestling wasn’t real, check out Batista in action!